Scrapbooking Class January 22 using NEW Spring Products ! Register today! This is your opportunity to have a sample of all the new Designer Series Papers & Core'dinations Card Stock and/or Ribbons in the Stampin’ Up! Spring 2013 Catalogue at a fraction of the price! 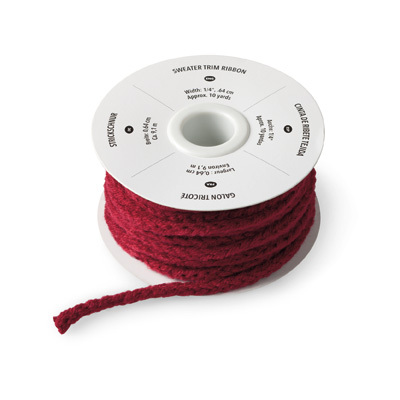 Start with sample sizes of all the new paper patterns and ribbons so you are know which ones you must have a full package of when you want to purchase more! 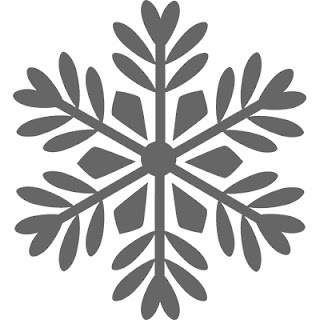 Pictures of the products cannot be posted online until January 3, 2013 as per Stampin’ Up! Check your mailboxes for the FREE copy I have sent you ! Over $118* if you purchased full packs of all listed above. *cost varies according to your provincial sales tax. *cost varies according to your local sales tax. Order both the Spring Paper Share and Ribbon Share and save $3! 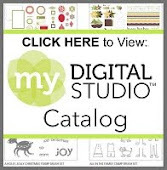 Spring Catalogue Paper and Ribbon Share : Only $45.00! 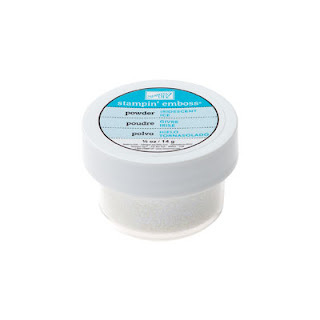 Add $9 shipping for the bundle. Please indicate which of the shares (paper, ribbon or both) in which you would like to participate. If you are not able to pick up in my studio in Montreal, then please provide me with the shipping address you would like me to send it to. Thanks! Here is a copy of the card I sent out this year to my friends...check your mailboxes Monday! I have had a wonderful time resting with my family this year. We have made many memories and had some much needed "downtime" this year. If you take a peak at the photo below, you'll notice I used the single stamp that says Happy New Year (since I knew the cards would arrive prior to New Year with how late I put them in the mail). Yup that's right, even though I start teaching Christmas cards in July, my own personal ones, never get mailed before Dec. 20th. Bad hun? Perhaps that should be one of my resolutions for next year! Thank you all for being such fantastic friends and customers! I am so happy to get to stamp with you and look forward to more stamping soon! How about a 9 Hour CROP in January? To keep the costs lower, I will not be including lunch or dinner, so please provide your own or feel free to order in or go pick something up from one of our many local restaurants! Stampers Club Members recieve a FREE Class each month, get to be hostess one of the months and receive all the benefits!, earn a discount on all my classes, crops and Weekend Retreats (next one in April 19-21) ! It pays to be a club member! We have been relaxing and celebrating with family ! Will post pics later in the week! 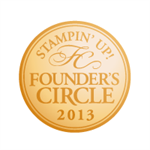 read below for a Stampin' Up! Boxing Day sale! Today is Day 12 of the 12 Days of Christmas! I hope that you've enjoyed this as much as I have! to give or receive . A handmade box that cards can fit inside! - my favourite colours this holiday! stay tuned in the new year for those classes! The box is made using just one 8.5 x 11 sheet of gumball green cardstock ! Below is a template for you to see how I cut it. The scoring is super easy..on one of the long ends (11 inches) you score at 2" and 3"
On the other 3 ends you score at 1" and 2"
The Designer Series Paper (patterned paper) is from ...you guessed it - Be of Good Cheer ! I also took a 1 inch strip of cherry cobbler and punched it using the scallop trim border punch. I attached the box using sticky strip since I don't want it to come apart. Be of Good Cheer cardstock I had cut at 1/2 an inch. The 2 3/8 scallop circle punch was used to punch out the cherry cobbler scallop circles. On the box itself I also cut a very vanilla circle out with the 1 3/4 circle punch. The candy cane was stamped in cherry cobbler. The gingerbread man was stamped in early espresso. The trees were stamped in gumball green. and popped them up using stampin' dimensionals. Handmade gifts filled with love. Voila ! Simple and always a WOW. 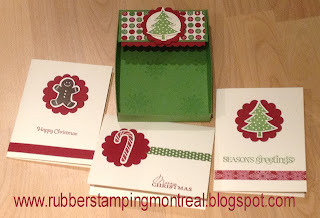 To buy any of these or other Stampin' Up! products, please contact me! 12 Days of Christmas Specials. I will be putting the order in by 9pm. Be sure to email me your orders ! Did you know ? I am now booking SALE A BRATION 2013 parties !! 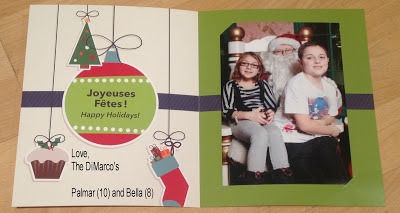 Take a peek at this non traditional looking Christmas Card! It is on a Razzleberry Ripple base cut at 5.5 x 8.5.
which I ran through the Big Shot with the polka dot embossing folder. I also added some raspberry ripple stitched satin ribbon. but don't wait...the single stamps are only available until Jan. 2! over top and heated it with my heat tool ! If you’ve ever embossed before, you know what fun it is to see the powder melt into a smooth, shimmery image, right before your eyes. If not, you are in for a real treat! Embossing gives a gleaming, finished look to any stamp project. Once cooled I punched it out using our blossom punch! To add dimension, I also punched a piece of pretty in pink through the blossom punch as well and off set them a bit. 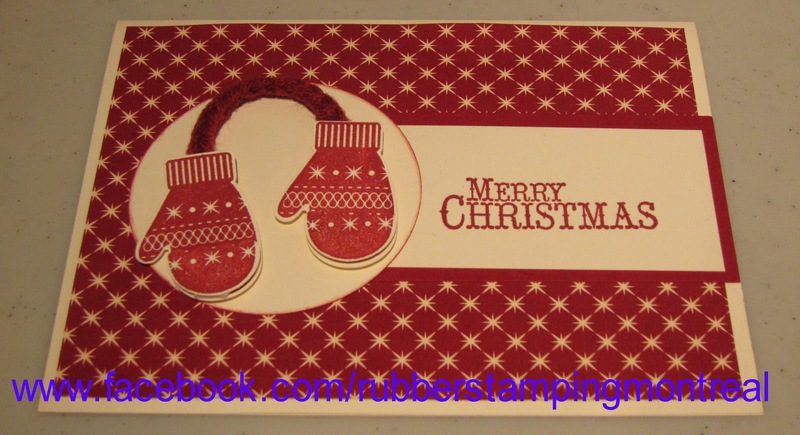 They are both popped up using our stampin' dimensionals. I also added a jumbo pearl to the center! here are the instructions on how to make it !!! If so...look out in your mailboxes for the Spring Catalogue ! 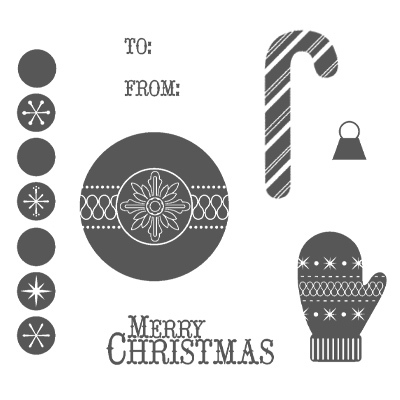 Take a peek at this adorable mitten card! 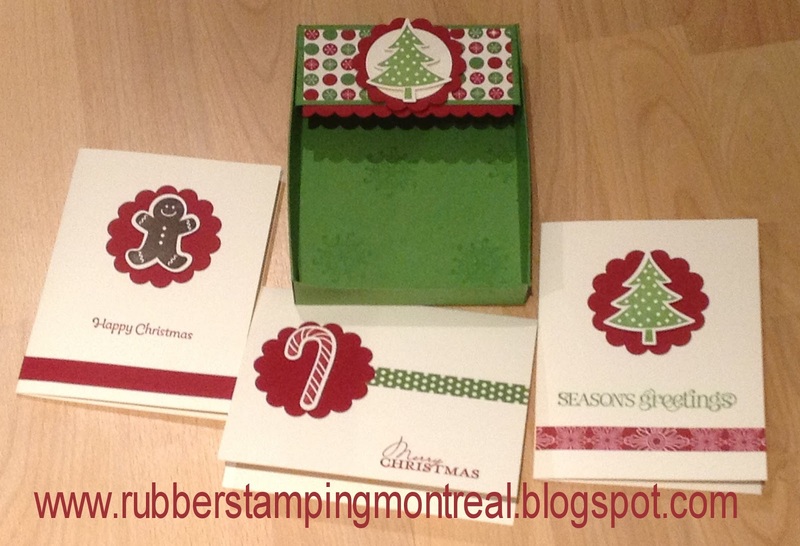 cherry cobbler ink (my favourite colour this holiday season) on very vanilla cardstock. I punched the mittens out using the mitten punch ! I even used the cherry cobbler sweater trim ribbon. The card base is very vanilla...and the mittens are popped up with dimensionals on a 2 1/2 inch circle. Today I wanted to show you the treats that my daughter has been making for her friends and teachers. They may look familiar to you since I have also been selling them at my craft shows this holiday season! Narrow cellophane bags perfect for filling with a row of treats, a pencil, or anything! 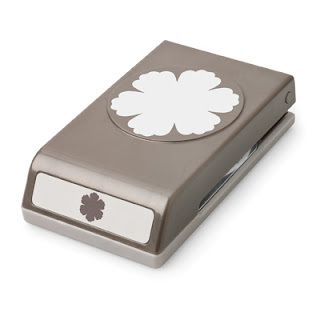 Great for gifts—add a tag or topper you’ve created using any punch or Big Shot die. Adhesive on top keeps everything inside. Each measures 1" x 8". 50 per package. The topper is a 4x2 real red piece of card stock. I will admit the stamp used is a retired stamp , but one I will be keeping forever! You will always have those stamp sets that are your "go to" stamp sets...this is one of them for me! It is punched out using the scallop circle punch.